The refrigeration plant on a fishing vessel is one of the main contributors of the overall energy usage of the vessel. Any increase in efficiency of the refrigeration system will reduce the fuel consumption and can improve the overall efficiency of the vessel. The Montreal Protocol states that all environmental impacting refrigerants must be phased out. Therefore there is a need to find an environmentally friendly refrigerants that meets the global legislation requirements as well as high refrigeration efficiency. 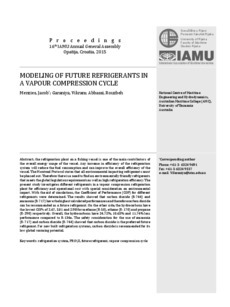 The present study investigates different refrigerants in a vapour compression refrigeration plant for efficiency and operational cost with special consideration on environmental impact. With the aid of simulations, the Coefficient of Performance (COP) for different refrigerants were determined. The results showed that carbon dioxide (R-744) and ammonia (R-717) have the highest calculated performances and therefore carbon dioxide can be recommended as a future refrigerant. On the other side, the hydrocarbons have the lowest COPs of 2.67, 3.01 and 2.98 for methane (R-50), ethane (R-170) and propane (R-290) respectively. Overall, the hydrocarbons have 24.72%, 10.63% and 11.74% less performance compared to R-134a. The safety consideration for the use of ammonia (R-717) and carbon dioxide (R-744) showed that carbon dioxide is the preferred future refrigerant. For new built refrigeration systems, carbon dioxide is recommended for its low global warming potential.